As a cardiothoracic surgeon, Dr. Douglas Wood helps turn lung cancer patients into survivors by operating to remove tumors. But his biggest medical achievement, he said, came far from the operating room. On Feb. 5, 2015, the Centers for Medicare & Medicaid Services announced it would cover lung-cancer screenings for people ages 55-77 with a smoking history of one pack a day for 30 years or two packs daily for 15 years. The decision was motivated by the advocacy of an expert panel led by Wood. “More people in the United States die of lung cancer than the next three cancers combined (breast, colon and prostate),” said Dr. Doug Wood. Wood, chief of the University of Washington’s Division of Cardiothoracic Surgery, chaired the National Comprehensive Cancer Network Lung Cancer Screening Panel when it became the first U.S. group to recommend lung-cancer screenings, based on the results of a large study. He and colleagues pushed the U.S. Preventive Services Task Force to consider similar guidelines for privately insured patients, and then convinced Medicare to provide coverage, too. It was a hard-fought journey of education, advocacy and grassroots politics, said Wood, who is passionate to increase survival rates of anyone facing the disease. The cure rate of lung-cancer patients, at all stages, is currently only 16 percent, he said, but if the cancer is identified early and the tumor is small, the chance of cure rises to 70-80 percent. And patients seen in lung-cancer screening programs have an 80-85 percent chance for a cure, he said. 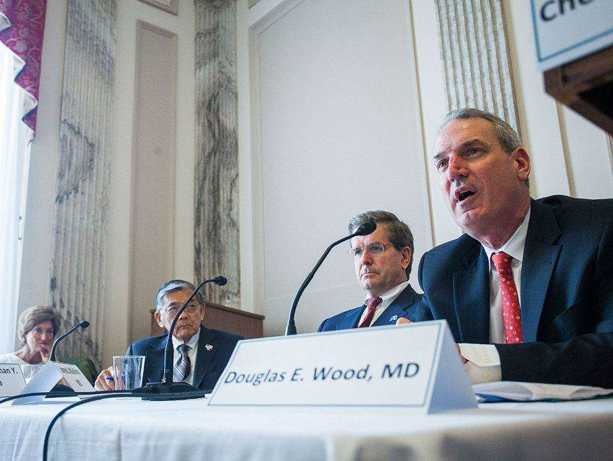 Wood's journey into political action began in 2011, when a large national screening study demonstrated a 20 percent decrease in mortality for lung-cancer patients. “This was one of the largest cancer advances in a generation,” he said. But it took significant effort to get the government to act on this news. Wood worked with other organizations such as the American College of Radiologists, the Society of Thoracic Surgeons and the Lung Cancer Alliance, a patient-based group, to educate policymakers and to pressure the U.S. Preventive Services Task Force, an independent group that makes recommendations for preventive clinical services. Wood and a colleague wrote an op-ed in the Wall Street Journal and in the summer of 2013 testified at a Senate briefing. In December, 2013, the Task Force recommended lung-cancer screenings and, by law, the Affordable Care Act required private insurers to cover that service. But Medicare did not immediately follow suit, initially stating that the harms of low-dose radiation and “unintended consequences” outweighed the potential benefits. That was a tough day, Wood said. “Some of the people I was working with were devastated." But rather than give up, they regrouped. Wood and colleagues – Dr. Ella Kazerooni, a radiologist at the University of Michigan representing the American College of Radiologists, and Laurie Fenton, CEO of the Lung Cancer Alliance – drafted a 40-page report endorsed by 50 other groups. They continued to meet with policymakers. Ultimately their persistence won out.